Elco No. 7 served the Navies of the United States and Italy. Motorboat: Built in 1917 as Elco No. 7 by the Elco Co., Bayonne, NJ for the Italian Government as an anti-submarine motor launch ("motoscafi antisommergibili", or "MAS",). 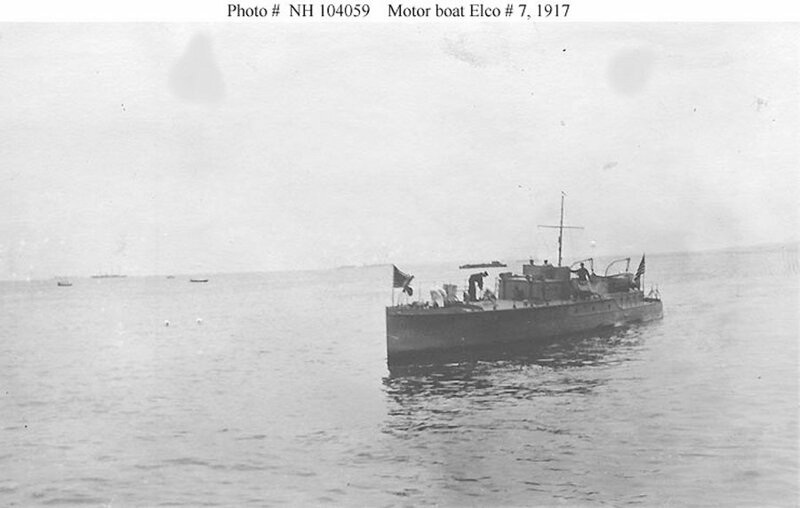 In April 1917, soon after the United States entered World War I, she was taken over by the U.S. Navy and placed in service as Elco No. 7 (with no SP or ID number assigned). Delivered to the Italians in December of that year, she entered Italian Navy service 17 June 1918 as either MAS-77 or MAS-78. Specifications: Displacement unknown; Length 80'; Beam unknown; Draft unknown; Speed unknown; Complement unknown; Armament unknown. 61k Photographed in 1917, probably when first completed. There is no DANFS history currently available for Elco No. 7.